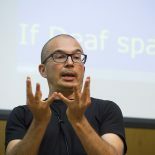 For a while now, I’ve been in discussion with a Deaf friend of mine about the best way for hearing people to work with Deaf people to transform academic settings… to ‘bring in’ or ‘let in’ Deaf knowledge, and change the way that we think about Deaf people. One option that has recently come up, is whether this could be achieved by me getting involved in the growing field of disability studies. Why (you might be forgiven for asking) would you want to explore disability studies when you’re on the record arguing that disability frameworks don’t work for Deaf people? Well, despite the fact that I don’t think disability describes Deaf people, Deaf people are considered disabled by the majority. So hardly a day goes by at work without someone making the easy mental connection between Deaf history and disability, and wheeling out an array of assumptions that I then have to address. But despite the fact that I don’t think disability studies has done a particularly good job of dealing with issues surrounding Deaf people, and their Deafhood identities and politics, I do think that that ‘disability’ more generally is a fascinating, untapped, subject. Think about what ‘dis-abling’ really means, and it’s about those whom society makes less able. Who is that? Well… how about poor people, or women, or Muslims, or Aboriginal people groups, or those who live in the wrong place, or have an unacceptable aversion to capitalism, or are pacifists… or are different in any unacceptable way. Dis-abling is a restrictive set of practices that are somehow socially licensed by our intolerance. Sen would say that it’s an explicit refusal to allow us to live out our capabilities. Sartre linked it to a more general tendency towards humans oppressing others any time they get the chance. Foucault identifies it as the need to protect and police and ensure the survival of ‘society’ as we perceive it. So surely, dis-abling is to do with oppression, difference, stigma, attitude… diversity, and how humanity might, through creativity, acceptance, and other transformative ways of being, better manage those things. See the potential in critical disability studies? And there are critical disability theorists who are also asking these questions about what it means to be human, and ‘Other’, and ‘different’ and ‘normal’… and that makes disability studies, actually, fascinating. Who wouldn’t want to play in amongst all that? Except – and here’s the thing – if I were to move into disability studies, because my work is immediately connected to the Deaf community, it’s all too easy again for people to say “Ah, well, of course…”, and move with the immediate connection between ‘Deaf’ and ‘disabled’. That might be OK for someone who is, themselves, Deaf – and able to outwork the tension in their own lives. Or maybe even for a hearing person who is comfortable in that position. But for me, to bring Deaf people into that kind of association uninvited, even with a wish to use that position to explore ways to challenge the association of disability and Deaf community? That for me, is one step too close to the fire. There’s recently been a job advertised in Bristol in disability studies. Ironically, having said what I’ve said above, I only found out about it because it was pushed across my desk by someone who assumed that Deaf = disabled and so thought I would be interested! Although I’m entirely happy within the Deaf church project, I was interested… and I’d be utterly delighted to work with anyone who gets it to explore some of the areas that I’ve talked about above. But for the moment, I’m too excited about our present project and the opportunities that are developing to begin to establish a presence for real, Deaf-owned spaces of knowledge within the hearing university, to put those at risk by taking on an even riskier approach. The potential is there for the right person. But that person isn’t me. Hi, I think you’re right. I think that since deafness (and Deaf people’s place within the whole narrative of deafness) is largely constructed by the bigger narratives around disability, it’s absolutely crucial for Deaf people to be engaging with disability studies. But that’s something that has to be initiated by Deaf people… because of the things that you say – the generations of oppression and the lack of rights. As a hearing person, I can’t decide that it’s ‘time’ for Deaf people to engage with disability theory… any more than I could say (as a straight, white, male) that I think women, or Gay people, or Black people ‘should do… X, Y or Z’. That’s also why, at the moment at least, I can’t voluntarily take up a position within disability studies. I can’t drag Deaf people into that association without their permission, and I don’t feel that I have that permission. This entry was posted on May 16, 2014 by Mike Gulliver in Musings.